Posted: Friday, July 6, 2018. 10:59 am CST. 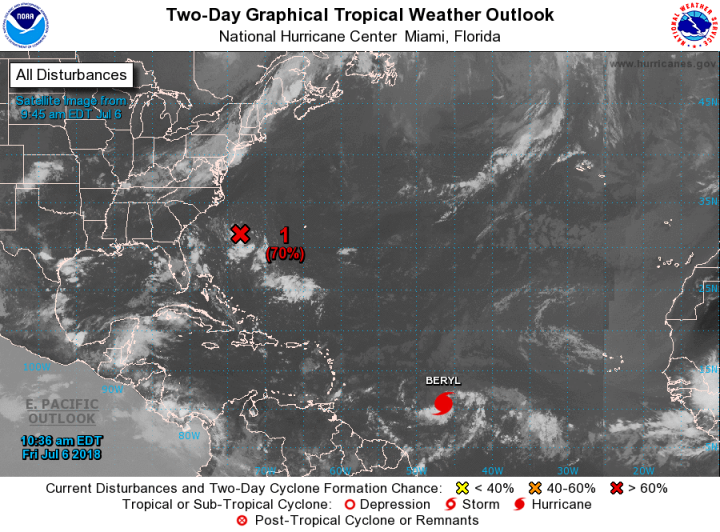 By BBN Staff: Beryl became the first hurricane of the 2018 Atlantic hurricane season today. As of 11:00 a.m. today, the eye of Hurricane Beryl was located near latitude 10.7 North, longitude 46.5 West. Beryl is moving toward the west near 15 mph (24 km/h). A faster westward to west-northwestward motion is expected to begin over the weekend and continue through early next week. It is forecast that the center of Beryl will approach the Lesser Antilles over the weekend and cross the island chain late Sunday or Monday. Maximum sustained winds have increased to near 80 miles per hour (130 km/h) with higher gusts. Over the next couple of days, Beryl is expected to continue strengthening and may still be a hurricane when it reaches the Lesser Antilles late Sunday or Monday. After reaching the eastern Caribbean Sea, Beryl is expected to weaken. Beryl is a compact hurricane with hurricane-force winds that extend outward up to 10 miles (20 km) from the center, and tropical-storm-force winds extend outward up to 35 miles (55 km). At this time, there are no coastal watches or warnings in effect, however, interests in the Lesser Antilles should monitor the progress of Beryl, as hurricane watches could be needed for some of the islands by tonight.